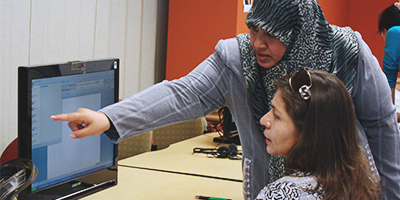 Computer Training at the Arlington Public Library is free and open to the public. A library card is not required to register for or attend a class. Classes last up to 2 hours. Class topics range from basic computer skills to Microsoft Office classes. Participants may register for a class starting two weeks before the class is scheduled. Participants must pre-register for all classes, including Saturday classes. Register for classes online (click the class name) or by calling 817-459-6900. You may only register yourself and one other family member. Classes are limited by the number of available computers. Due to space constraints, only one person and one chair per computer. Classes will begin promptly at the time scheduled. You must arrive 10 minutes ahead of class to ensure your seat. Five minutes before class we will start assigning empty seats to those on the waiting list. Individuals who are wait-listed for a class may come to class and check in with the instructor. Five minutes before the class begins, empty seats will be assigned based on who arrived and checked in first that day. Any individual who registers for a class must attend or cancel their registration before the class begins. If an individual fails to cancel or attend more than two classes in a month, they may be suspended from registering for computer classes for the next 30 days. Interested in teaching? Volunteer to be a Cyber Coach! Click here to view upcoming computer classes. Ratatype Ratatype is a social online typing tutor that allows users to master their typing skills, challenge their friends in typing speed and accuracy, or earn typing certificates. FreeTypingGame.Net Test your typing skills. Ten Key Test Practice 10-key typing (using the numeric keyboard). Introducing the Mouse Beginner mouse use. Senior Net Mouse Tutorial Mouse skills for seniors. ejercicios del ratón En español. GCFLearnFree.org: Online tutorials on everything from computer basics to social media (Facebook, Twitter, etc). You can choose to follow a Lesson, click through an Interactive, take a quiz in the Extras, or watch a Video. Computer Basics – Getting started with desktop and laptop computers. Internet 101 – Tips for browsing and strategies for searching online. Internet Safety – Avoid the most common threats and learn how to protect your data and privacy. Email 101 – Introduction to email basics, etiquette and safety. Beyond Email – Chat, Skype, blogging and more. Learning Express Library Software Tutorials: Interactive video tutorials to master computer and internet basics, popular software programs (Microsoft Office), and more. It requires a library card and a free account set-up. Lynda.com is an excellent online learning tool offering hundreds of video courses and tutorials in software, creative and business skills. Library card is REQUIRED; at first use, you will have to create an account. Microsoft Online Training for Office: Online tutorials for Office Word, Excel, PowerPoint and more.